Sciblogs | Sponsoring species – is it worth it? Sponsoring species – is it worth it? From the Yellow-eyed penguin to the Kakapo, companies are keen to associate their brands with efforts to save some of our iconic native species. Is this funding worth it? Hell yes! As Department of Conversation spending on preserving biodiversity comes under pressure, private money is increasingly being sought to support conservation efforts. We need these public-private partnerships more than ever. This Dominion Post article from 2012 article outlines the impact on the Kakapo Recovery Trust that was expected in the face of the New Zealand Aluminium Smelters withdrawing its funding after 22 years. NZAS appears to have hung in there with its sponsorship and this year will round out 25 years of support of the Kakapo Recovery Trust. BNZ has put its money on the Kiwi with Operation Nest Egg. 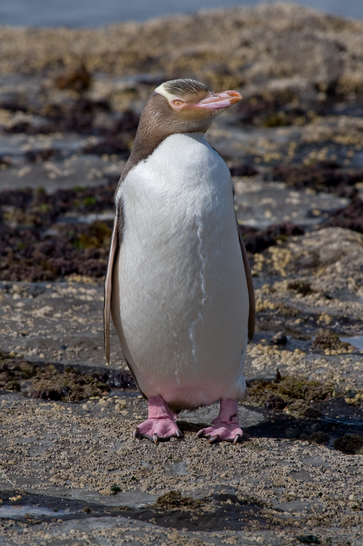 Cheese maker Mainland supports the Yellow Eyed Penguin Trust while Dulux, in addition to sprucing up DOC huts with a fresh coat of paint, sponsors Kea conservation efforts. The list goes on – you can see the goodwill associated with efforts to preserve our “charismatic” species. New research led by Australian and New Zealand scientists suggests that privately sponsoring the conservation of charismatic ‘flagship’ species can also help save other species from extinction, putting into question the notion that this approach to conservation is biased and inefficient. The researchers looked at the conservation actions for 700 of the most threatened species in New Zealand and argue that while other species’ conservation also improve from funding ‘flagship’ species, it could be boosted further if these funds were “optimally allocated among all threatened species”. 1. use objective criteria for baseline funding of threatened species conservation, and use private funding for flagship species conservation as efficiently as possible to maximize shared benefits with other species. If private donors are made aware of the ancillary gains from their flagship species sponsorship, this may encourage further donations or new partners. 2. Encourage donations to a broader suite of flagship species, to maximize possibilities for efficient sponsorship through shared actions with other species. As noted by Verissimo et al., using a relatively large ‘flagship fleet’ can potentially appeal to a larger pool of donors. Our results show that a ‘flagship fleet’ can also allow additional flexibility to increase the efficiency of allocating conservation funding. If donors wish to sponsor an individual species, they can be encouraged to sponsor species whose conservation actions result in the greatest additional biodiversity gains. If donors are willing to sponsor a ‘flagship fleet’ of species, the money can be used to fund the specific actions with the great- est additional biodiversity gains. 3. Explore the possibility of encouraging private funding for general biodiversity goals. Although private funding for flagship species can help to conserve biodiversity, in general, it can only supplement, not replace, funding based on objective criteria. If such supplemental funding can be used in the most efficient manner possible, the greatest biodiversity gains can be achieved. “Private conservation funding in New Zealand is growing, and growing rapidly. Thank goodness for it, because we need it. Public funding for conservation is not enough to halt further species declines and extinctions, let alone recover those species already in trouble. Policy diversity begets biodiversity – the more tools we can apply the greater variety of good outcomes that are possible. Private funding of iconic species is a new and increasingly used tool in New Zealand and through it outcomes will be achieved that would not otherwise be possible. The 10 species in the article which benefited from private-public partnerships are just a few, perhaps only a quarter to a third, of NZ species that might attract private funding. The potential is for rapid economic growth in privately funded conservation. Consider also that many of the programs to conserve NZ’s iconic species are inefficient. They are expensive and success is unlikely. Indeed, those iconic species will probably be reliant on a high-cost conservation investment for a very long time to come. Where, however, their iconic status can also attract private funding, they can at least improve investment and outcomes for other species. Although the authors do not consider it, we shouldn’t also discount the potential for private funding of habitat, landscapes, and ecosystem functions. Some with cash to spare will be attracted to the idea of supporting many species at once – communities of plants and animals, landscape vistas, or particular services that the ecosystem provides, like animal pollination or drinking water quality. We know that conservation at such larger scales, when it is possible, is more efficient at conserving biodiversity. I expect private funding for those things would result in even larger gains in plant and animal conservation than those described by the authors who focussed only on privately funding of individual species. “But we shouldn’t make the mistake of believing that any one policy will do the job on its own. Private funding for conservation is just one tool in our toolbox and we need to learn how to use it well and when it is best used. This is our next challenge. For many however, private funding will distort what would be regard as sensible conservation priorities. The debate about what is important and what is not will continue. And it should. The debate is important. The author’s however, go some way to demonstrating that private funding is a help, not a hindrance. Nevertheless, not all private funding is the same. In time, conservationists will also be challenged to structure funding and discriminate amongst private funders to ensure that conservation is not prejudiced by a few elites.